Use these 6 dashboard reports to automatically present your HubSpot data so you never need to touch a marketing spreadsheet again. When we initially started the Databox Partner Program in January 2017, only about 10 brave HubSpot agencies were willing to give us a shot. Those 10 tiered HubSpot partners had worked with our CEO, Pete Caputa, during his time at HubSpot, and they were curious about his next crazy idea. In the following 6 months, we added 70 more HubSpot agencies to bring our total to 80. With that new community, we began to learn about MANY unique reporting processes. Agencies were hammering us to pull new metrics from HubSpot on a daily basis so they could completely avoid copying and pasting into spreadsheets every month. Some of these metrics were readily available via the HubSpot API and others required creativity for our engineering team to extract. Sometimes, we had to get help from the amazing HubSpot Connect engineering team to figure out how to pull new data points. After all, there was no point for these agencies to move from monthly KPI spreadsheets and Powerpoint reports to our automated, real-time dashboards if they couldn’t pull the metrics that help them grow and retain their client accounts. After months of feedback and requests, we finally figured out how to import 145+ metrics that any HubSpot partner would want to monitor. While we’re still waiting on some new APIs to do everything that’s been asked of us, we can automate most HubSpot partner needs. And although the list of requests never really ends, these five reporting dashboards have been popular with almost every HubSpot partner in our community. We now use these 1-click templates to get agencies up and running within minutes. Usually, agencies then want to try another one of our 30+ digital marketing integrations, like Google Analytics, Facebook Ads and AdWords. These 6 are part of our Template Library, so you can use them instantly and for free. Try them out and start tracking your data in real-time! Problem it Solves: If you’re doing this whole inbound marketing thing right, you should be tying your marketing efforts to the client’s quarterly or annual revenue goals. 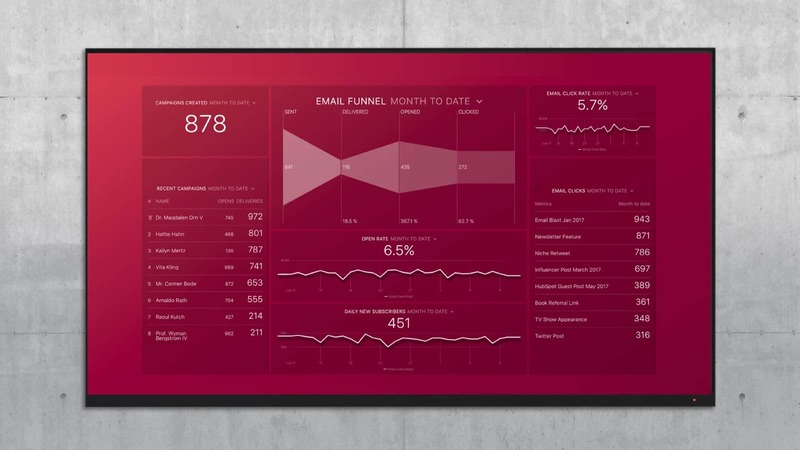 This dashboard looks at revenue goals, and then helps you communicate your traffic and lead targets based on that goal. You can examine every step of the funnel, from visitors to leads to customers to revenue. By looking at performance over time, you can also make sure that you convert prospects at a consistent (or improved) rate. This dashboard is the first and most important one because it proves to the client that you are dedicated to helping them reach their targets. How To Use It: Let’s say that your client wants to do $200,000 in revenue this quarter. 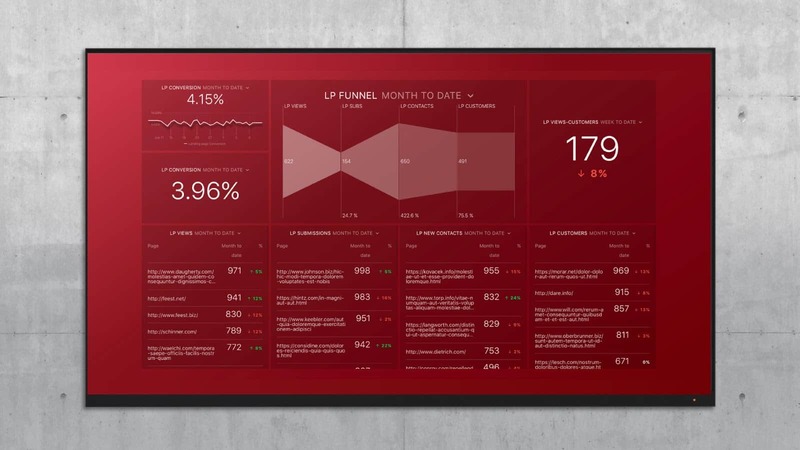 This dashboard will display this entire funnel, as well as the conversion rates along the way. So, if you are bringing in well-qualified traffic, perhaps your visitor-lead ratio will go up and you will not need to drive as much traffic. You can keep track on a monthly basis to make sure you are on pace for the quarterly goal. This guide will tell you more about how to plan this process. How many leads do you need to achieve your revenue goals? How much traffic do you need to achieve your revenue goals? Problem it Solves: If you only review performance of your blog posts every month or every quarter, you are missing out on powerful analytics that you can present to the client. Your past blog post performance should provide direction for the topics your content team will write about next. Further, you should be monitoring the performance of individual posts in real-time, especially after publishing and promoting new ones. This way, you can further promote the posts that succeed with email subscribers or on social media. 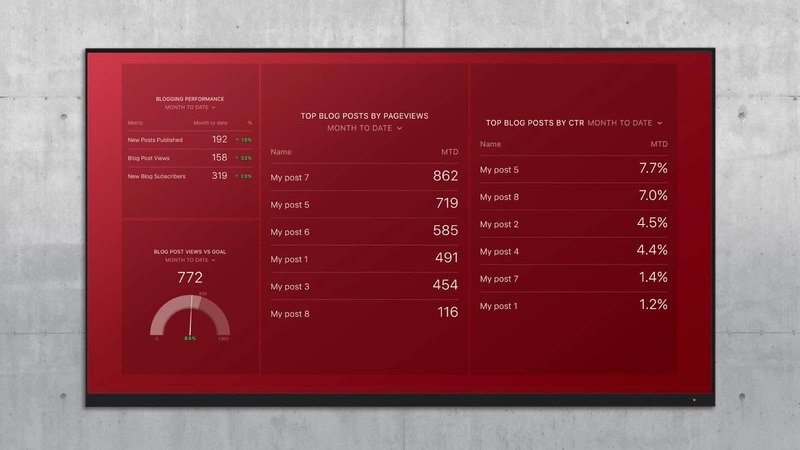 This dashboard keeps you up to date on your top posts for the month. With it, you can ensure that you are on pace to meet your monthly traffic goals. If one post outperforms expectations, you can even use our Alerts feature to notify your client as it’s happening. If you’re not already leveraging your client’s social reach to amplify the success of content, now is a good time to suggest it to them. Another reason this dashboard comes in handy is for historical blog post optimization. When a blog post performs well the first time, and especially if it’s ranking well in search, it’s a good idea to update it with new material, republish and promote it again. How To Use it: In an ideal world, every highly viewed post would also generate leads at a high rate. Unfortunately, this rarely happens. Some posts draw a wide, diverse audience that will never be interested in your product. Other posts are highly targeted at a specific niche and convert many visitors to leads, but struggle to help you meet traffic goals. You can now make decisions in real-time so you can bring insights to the monthly client meeting. Let’s say one post generates a lot of traffic, but not many leads. You can try split-testing the call-to-action before the client meeting, and show your clients how your quick-thinking strategies created more leads for them. What percentage of traffic comes from old versus new posts? How do users engage with different topics? How does this month’s activity to last month? How should you re-prioritize your blogging strategy? Bonus: Wanna dig a bit deeper into your client’s blog performance? This Google Analytics blog performance dashboard will help you do that. Problem it Solves: Leads are a great metric for determining qualified traffic. With dozens of digital marketing opportunities available at any given time, you need to find a way to cut through the noise and focus on your most productive channels. Maybe you are trying guest blogging, or social ads, or content marketing. Whatever the case, you can evaluate the visitor-lead ratio for each source to find your most profitable channel. How To Use it: This dashboard helps you make two types of decisions. First, you can decide which traffic source as a whole to focus on. For example, let’s say that you want to focus on social ads for a quick traffic boost. The left column of this dashboard can show you whether those visits actually turn into leads. Instead, you may find that organic traffic has a much higher conversion rate, and therefore, you should write more content. Also, you can find opportunities within each traffic source. The middle-right column breaks down both referral traffic and social traffic into individual domains. Let’s say you are selling real estate software, and you find that most contacts come from a few specific publications. You may want to reach out to those publications to do a guest article or run an ad for more exposure. Which sources bring the highest quality visits? How does conversion rate vary across channels? Which social sources generate the most leads? Problem it Solves: If you have developed a series of landing pages with offers like e-books, whitepapers and webinars, you need to track which ones create leads and customers. This dashboard allows you to discover which landing pages help you towards your monthly goals, and which need improvement. How To Use it: Similar to the blogging dashboard, this one also helps you understand the conversion rate of each page. If you have a landing page that drives plenty of views but few submissions, you need to review the copy on the page and adjust the call to action. If you have a landing page that gets plenty of submissions but generates few contacts, perhaps you need to improve the quality of the offer itself so that prospects get excited about your brand. If you have a landing page with a great conversion rate but little traffic, you need to drive traffic by using ads or improving SEO. When you put this in a dashboard with clear month-to-month changes, your client can quickly understand the results of your efforts. If you make a few changes that drive more leads, you can visualize the changes throughout the funnel. Which landing pages get the most views? Which landing pages create the most contacts? Which landing pages were responsible for new customers? How are conversion rates in the funnel? Problem it Solves: You probably want to avoid nasty email surprises that magically come up during a monthly data review. For example, you do not want to learn at the end of the month that your emails increasingly go to spam folders. Nor do you want to explain to the client why open rates go down with every campaign. 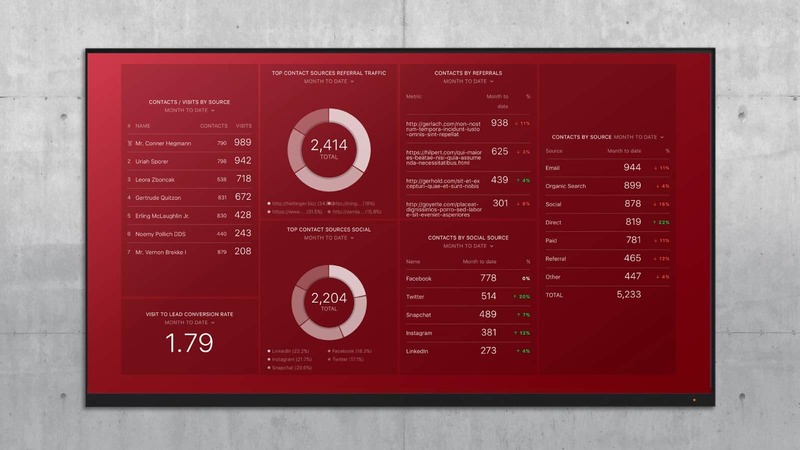 You can use this dashboard to show engagement on an individual campaign basis. When you monitor the health of your email list in real-time, you can make proactive decisions around your subject lines, content and unsubscribes before the end of the month. How To Use it: “Email fatigue” is the gradual erosion of subscriber’s interest in your emails. It is characterized by disengaged subscribers that stop opening your messages and clicking links in your emails. And, if you continuously send email to disengaged subscribers at specific companies, you may soon find yourself in the spam filter. If open rates are low, you may need to try more relevant subject lines. Or, you may be sending at the wrong time of the day to your subscribers. You can try personalized send times to alleviate timing issues. If open rates consistently drop, it may be time to fire some of your subscribers and remove them from your list. If they have not opened any of your last 10 emails, they will not miss you anyways! If click rates are low, you may need to rethink your email content strategy. How many emails were delivered and opened this month? Are open rates going up or down? Which email campaigns are most popular with your followers? How many new subscribers join your list each day? How To Use It: You should identify 1-2 social networks that are worth your time and energy. There is no point in splitting your limited resources across 4 networks. 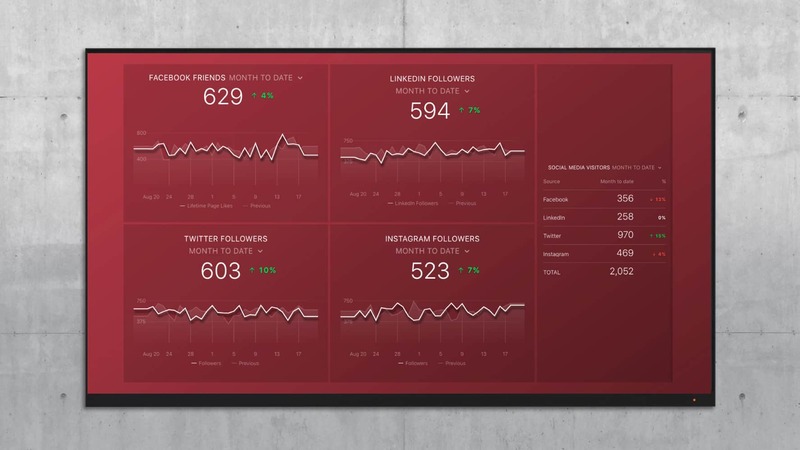 With this dashboard, you can identify your top networks by follower count and actual traffic driven to your site. You should have at least one clear winner with these two metrics. How has your following changed this month? What are your top sources of visitors from social media? How should you refocus your social media efforts? Want to track Pinterest too? We got you covered. Depending on the sophistication and needs of your client, you might need all these dashboards. On the flip side, if you’re presenting to C-level executives, the first, high-level dashboard might be enough. If you don’t need to provide detailed performance for each blog post, landing page and email campaign, you can use our Designer to combine the high level performance of all posts, landing pages and email campaigns into just one report. If your client has only hired you to create blog content for them, then you can just use the blogging dashboard. But, with Databox, you have the flexibility to show each client only what they need (or want) to see. And while these are our most popular HubSpot dashboards, with Databox, you have the ability to pull all of this data and much more from both HubSpot Marketing and HubSpot CRM. We’re pulling more than 145 metrics now! And it’s quick to get up and running. Once you set up a client with a Databox account, it takes less than a minute to set up any of these Databoards. So, you can even change which reports you present whenever you want. Set monthly Goals so your team and your client knows what you are aiming for. Set up Alerts to discover when you hit your monthly traffic or lead goal or when a key HubSpot metric is going down week over week. Combine your HubSpot data with another service like Google Analytics in the same dashboard. Sound interesting? If you would like to start rolling out automated reporting to your clients, create a Free Agency account now. Here’s the quick 5 steps you can follow to be up and running in minutes. If you are ready to stop pasting data into documents forever, check out the Databox Partner Program. Through our product, training and support, we help agencies use data to win new clients, strengthen relationships with existing clients and upsell clients into larger retainers.